The end of marijuana prohibition represents a once-in-a-lifetime opportunity to get in on the ground floor of the fastest-growing sector on the planet. This industry is about to mint more millionaires than the dotcom boom at the turn of the century. Today, you have the opportunity to become one of them. Our Master Key has not only doubled our money four times, but has also delivered average gains of 121% per stock. And our two newest recommendations are on track to exceed even those great returns. That’s why it’s essential that you download your FREE copy of The Master Key to Marijuana Profits. 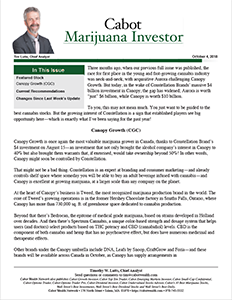 In it, you’ll get not only the full story behind both of these stocks, but also a complete and thorough analysis of the top marijuana stocks we are investing in now. In the bargain, you’ll receive a 30-day, no-risk trial to your annual subscription to Cabot Marijuana Investor—Wall Street’s first and only cannabis advisory that focuses squarely on this $50-billion-a-year industry. If you take a monthly subscription, you can cancel at any time. That’s why I’m glad you’re taking action today—because the big money is being made now. Once the bandwagon buying begins, you could miss out on windfall gains of 100%, 200%, 500% or more. But you’ll need to hurry. This offer is limited to the first 27 people who respond. 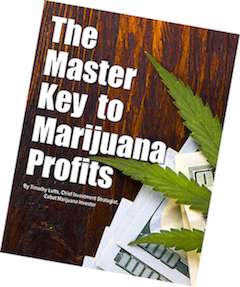 •	A FREE copy of The Master Key to Marijuana Profits, which includes my full research on our two newest recommendations, including my current buy-below and target prices on our entire portfolio of marijuana stocks. •	Complete access to our proprietary Master Key stock-picking system that has not only doubled our money four times, but has also delivered average gains of 121% per stock. Our monthly market update that will bring you a panoramic view of what’s going on in the market and how it affects our investments, along with our complete buy, hold, and sell recommendations. •	News updates and flash alerts on the stocks that we own, along with any adjustments we’re recommending for your portfolio. •	24/7 access to our private Cabot Marijuana Investor website, reserved exclusively for our members, containing our most recent issue and alerts, your FREE special reports and forecasts, and our archive of our past issues and reports that you can always access with the click of a mouse. •	BIG savings. Normally, a 12-month membership to Cabot Marijuana Investor is $497—but by joining now, you’ll pay just $397. •	100% money-back guarantee on your annual subscription—cancel your monthy subscription anytime. For more than four decades, the Cabot organization has earned not only the trust of the professional investment community but that of its readers as well. Frankly, we wouldn’t have been around this long if we didn’t deliver quality research, analysis, and most important, results. If you ever feel that Cabot Marijuana Investor is not delivering on this promise, just let us know during the 30-day trial of your annual subscription and we will send you a no-questions-asked, 100% refund. If you join us on a monthly basis, and then wish to terminate your membership we will do so before the next monthly charge. Subscribe now for immediate access.